What is the message of this cartoon? Compare and contrast this cartoon to the original. In what ways are the situations addressed in these cartoons similar? Are political cartoons really still necessary in American culture? After all of the propaganda that we are littered with every day, which is getting ridiculous, do we really need political cartoons to convince us to join the army, to risk our lives for our country? I know that it’s not an attempt at unification for our modern society…It seems the only thing that can unify us any more is a plane crashing into a building. What is the purpose? Well I don’t think this cartoon necessarily tells people to join the army. It might have more to do with joining the republicans and democrats togther against the War on Terror so terrorists won’t destroy America. aren’t army commercials the present day uncle sam posters? 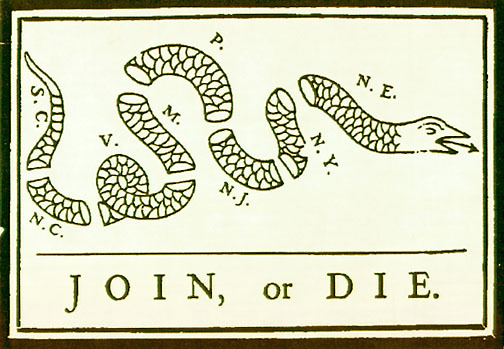 in what circumstance can the “die” in “join, or die” literally mean death? I know that the country would fall apart & the gov’t would ‘die’ without unity. I was just wondering when can death really result from not unifying? if another country decides to attack and your country is not unified, you are more likely to have a lot of casualties. however, if you are unified, you will be able to work together well and have success and victory. But what motivation does the public, YOU, have to be unified? Would YOU, being the advanced students that you are, be motivated to stand up as an American and work with the rest of the nation? Your peers probably feel the same way. Wouldn’t you agree that there’s an ignorance crisis in America today? Most Americans, including me, are ignorant of thier rights and freedoms as citizens of the greatest country on Earth, because they don’t know any better. Do we really have any motivation to do anything about it from a cartoon? 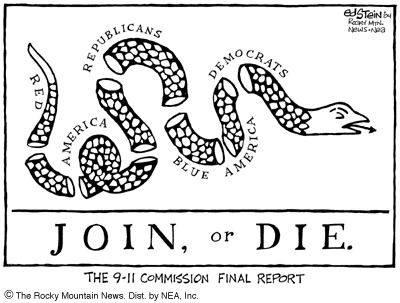 Please note that the second cartoon bears the caption, “The 9-11 Commission Final Report.” Do a little digging and find out what the reaction was to the release of this report in 2004– three years AFTER 9-11-01. Having said that, this is an interesting point you’re discussing. We no longer have a tendency to think of ourselves by our state affiliation before we think of ourselves as Americans, but the second cartoon suggests a new set of divisions being used. Think about that point. As you had said that Americans are ignorant, that also contributes to our arrogance. By you sauing that we are the best country on Earth, whats to say that England or Spain isnt the best country on Earth. Back to the unity, by having us unified it defends us from a more horrific death than if we were ununified. Yes in America we are very unified just take a look and see what happened after 9-11.
on the bottom of the cartoon in the book, it says that Delaware and Georgia were omitted from the cartoon. Why is that? You say that America is united. Yet we are not as united as much as, say China. One of my friends think that because of China’s government,they could become one of the great world powers. She thought that if the US got into another WW, then we might not have the resources to win–because we are no longer self-sufficient. Just look at the problem with gas prices…. What do you all think? why was GA and Deleware omitted? Franklin really is the greatest american of all time with this speech. It is interesting seeng the cartoons side by side. They both imply a sense of disunity. On a deeper level, it evokes the same message that Lincoln preached; that without cooperation and unification, America as a country can not function. This is especially important, considering in the first cartoon, it divides people by state, but in the second cartoon, it divides people by a set of beliefs. However, in light of the 9/11, it is important we put aside petty differences in the interest of national safety. This is similiar to how Franklin implies that the colonists needed to put down state differences, in the interest of unity and defense to make the revolution successful.